Once again we are camping in Canada. Amoeba is a guest speaker at a science convention and tomorrow he will be speeching about amoebas. We spent the day traveling across B.C. in our car, a tour bus and a ferry. 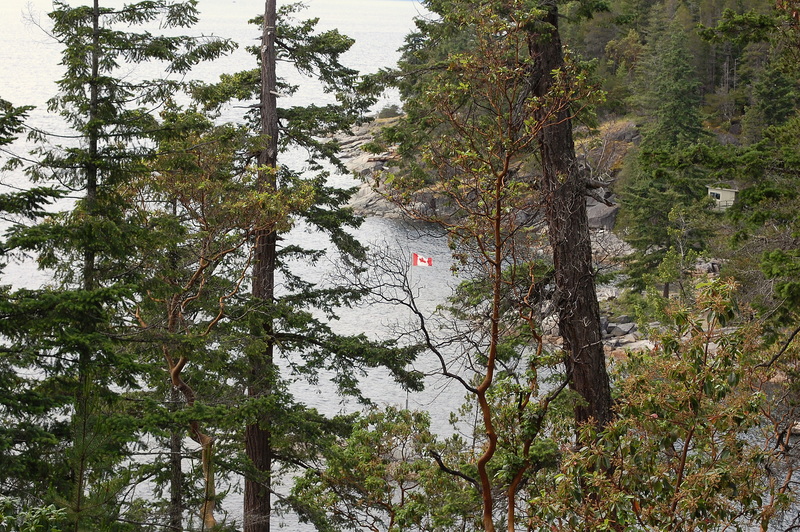 Finally, twelve hours after I crawled out of bed this morning we are here at Secret Cove in Halfmoon Bay, B.C. It is a bit larger than our little Eddie Bauer two man canvas tent. I’m sure glad I didn’t have to set it up! Here’s a quick glimpse inside. Ella went straight for the pillows. She said as far as tents go, she guesses this one isn’t too bad. Amoeba went straight for the internet. I went straight for my camera. We all have our priorities! Right now my priority is dinner. I’ll be back later to share a few more highlights. What a beautiful cabin — that’s my kind of camping! I hope you have a wonderful time. Susan — so far so good! Welcome Quilly, I hope you and The Amoeba and Ella have a wonderful time. Quaint little Cabin in the Woods, I could see myself staying here. Watch out for Yeti though. Someday you will have to visit my little part of the world. Bill, we’ve met some of the locals, but Yeti wasn’t among them. Ella reclined while Quilly cooked food. . . .
Linda — I learned that song in the third grade. And There’s no cooking in this tent. We get our meals at the main lodge. Your cabin looks nice, Quilly. Does it have a spare bedroom? We will be on the road this weekend after I get three of my teeth pulled tomorrow. Jim — no spare bedrooms but feel free to rent a tent of your own. That looks so inviting – inside and out! Carletta — the bed is a bit over soft, but other than that, it’s wonderful. Any tent that has electricity and indoor plumbing is a good tent by me!! It looks so inviting and relaxing. Looking forward to seeing more pics. Have fun! Church Lady — I may never again want to camp any other way! That “tent” is adorable, I want to stay there! SN — I know just how you feel. Looks great, Q!!! Have fun! Gigi — I have fallen in love with the heated stone floors! I know this is too literal but an amoeba giving a speech about amoebae is an image that cracks me up. Doug — I wish I had brought my video camera. It looks like a very cozy place! Have a great time together 🙂 . Rosidah — thanks. It is a cool place. Unfortunately, Amoeba is here to work so I won’t see much of him! How does that bed and tub fit in your backpack? Have fun. What a beautiful place. Nessa — I have no wish for the bed. It looks like a big puffy cloud and it sleeps like a big puffy cloud. I need more back support. The tub however is heavenly! This isn’t camping — it is GLAMPING — (glamor camping). Wow! It is so beautiful! I foresee lots of photos from this trip! Kelley — you must be clairvoyant! And a bathtub right next to your bed! ha! That´s what I call camping! Beautiful scenery ! Can´t wait to see more. Betty — bathtub on one side, shower on the other! This place is gorgeous. Akelamalu — that’s what I said. Wishing you a great time there (and great success to Amoeba tomorrow)! 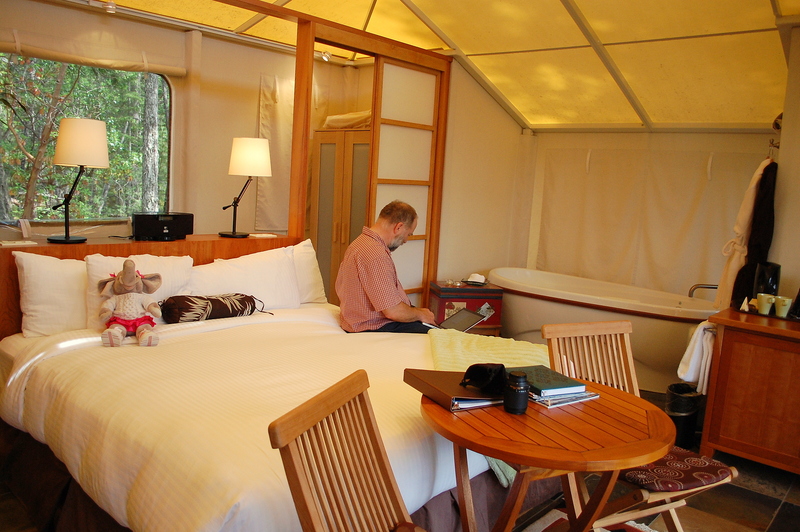 Nicole — the tent has a gas stove and heated stone floors. We haven’t been chilly. Since there are so many “permanent” fixtures to your tent, why don’t they put up a more permanent structure? Nessa — you seem to be missing the romantic aspect of this getaway. Oh, no. I think it is cute and adorable and I love it. I am just wondering why the outside is so temporary with all of the nice stuff. How does it hold up to the weather? Is it all only for the summer? I do not get it. Why is Mrs. Vanessa Kilmer obsessed with this blog? Please give us thirteen reasons. That looks fabulous! My daughter thinks it looks like a tree house. 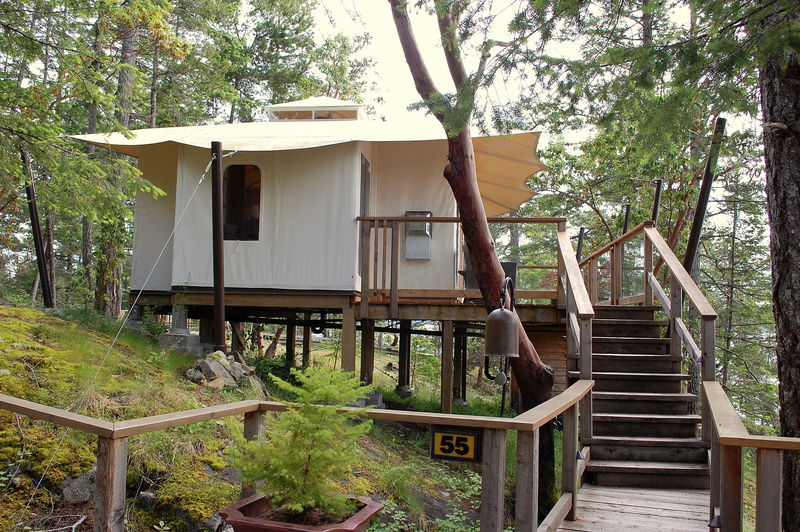 Mama Zen — built on the cliffs the way they are and accessibly only by boardwalks, they kind of feel like tree houses, although we’re just as happy to have them anchored to rocks. Looks like a yurt to me! I’ve often considered camping in one, and your pictures make me long for the luxury of a yurt. And the PacNW. Karen – -they are related to yurts in spirit if not in fact. That looks like a form of camping that I would actually enjoy trying! What a neat “tent”! Cindy — with maid service! I love the way you tent camp! Logo — we did internet, dinner, then pillows, but inserted a few other things in, too. I have a question about “the inside”. There is clearly a table and two unoccupied chairs. Why isn’t the laptop on the table with the amoeba sitting in one of them? Karen — because he needed the plug in which is behind the head of the bed. Jenn@ You know... that blog? Welcome back to Canada! Enjoy your stay. Please don’t feed the bears. Jenn — oh. We fed Little Bear. But he really isn’t a bear. Honest. That is a very classy tent. Looks like such a beautiful spot. I am green with envy. Raven — well, don’t be! The heater won’t shut off! Oh WOWWWWWWWW! THAT is MY kind of tent! It looks like you guys are having a blast! Rain, or not! I’m impressed! That is perfectly lovely. 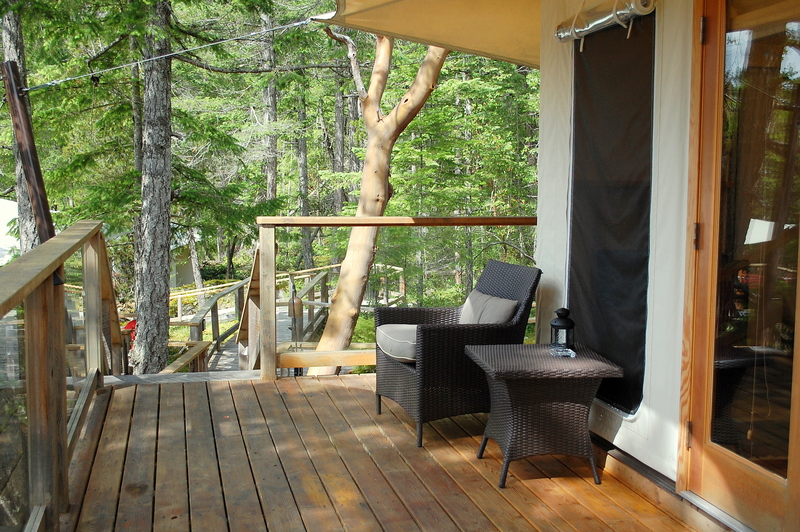 I’m trying to remember when we were in a cabin that nice with Internet service no less.